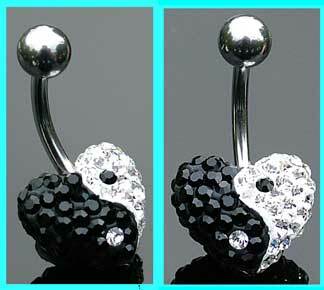 Classic Yin Yan disco heart belly bar which is available in a 6mm, 8mm, 10mm or 12mm bar size. The heart design measures 12mm and is set with lots of black and clear crystals. Due to ther nature of the design, this belly ring should not be worn whilst bathing/swimming. Powered by ShopFactory to sell P11514 online. All-in one eCommerce and online shopping cart software.